CA regulators reopen San Onofre settlement on Monday, saying they will re-examine the settlement that pushed the some $3.3 billion in costs for closing the San Onofre power plant onto consumers. The Public Utilities Commission said that parties involved in the case can submit briefs to comment on whether they think the deal reached in 2014 is “still reasonable” or should be amended. A PUC administrative law judge and a commissioner’s decision also bars the parties from having private communications with PUC “decision-makers” and advisers to commissioners. An executive of Southern California Edison, the nuclear power plant’s primary owner, held private discussions with the then-PUC President Michael Peevey before the PUC adopted the agreement. Last year Edison was fined $16.7 million by the PUC last year for failing to report the back-channel talks. Edison said the new order was being reviewed, but still believes the settlement “remains in the public interest,” said a company statement. 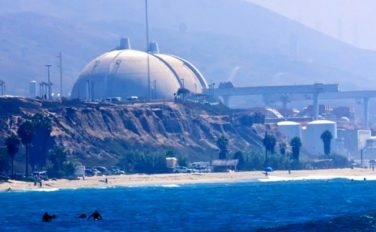 The twin-reactor plant in San Onofre, located between Los Angeles and San Diego, was shut down in 2012 after a small radiation leak led to the discovery of extensive damage to hundreds of tubes inside the virtually new generators. The plant never again produced electricity. In 2013 Edison closed the San Onofre plant during a fight with environmentalists over whether the plant was too damaged to safely restart. The PUC approved a settlement in 2014 between Edison and The Utility Reform Network, a consumer group known as TURN, that had ratepayers paying $3.3 billion in costs stemming from the plant’s decommissioning, while shareholders of Edison and minority owner San Diego Gas & Electric covered $1.4 billion. Matthew Freedman, a TURN staff attorney, said the improper communications cast a pall over the settlement deal. San-Francisco based TURN “looks forward to the opportunity to fight for better results for consumers,” said Freedman to the San Diego Union-Tribune. “This proves that when a small group of people come together to fight to the end, justice can be done,” Michael Aguirre, an attorney who sued to overturn the agreement, told the paper. “This will have to be done openly and on the record. We can win a fair fight,” he said.